Andrea Bo Macz grew up in the village of Piedra Pintada, on the Rio Dulce. Her father, a subsistence farmer, dropped out of school after fourth grade, and her mother, after second grade. Her father didn’t want her to study beyond sixth grade, but Andrea and her mother convinced him to let her study at Ak’ Tenamit. Andrea’s mother had taken courses at Ak’ Tenamit’s clinic to become a health promoter and midwife. After graduating, Andrea was hired by Fundación Guatemala to work on projects funded by donors such as the United Nations and World Bank. The foundation sent her to Nicaragua, Honduras and El Salvador to work with women’s groups and cooperatives in communities that were devastated by hurricanes to learn how they recovered, and are preparing for future disasters. She then created a training manual and began working with women’s groups in approximately 20 rural Guatemalan communities, helping them to map risks areas and develop plans for what to do when a natural disaster strikes. She also helps them improve their farm production, and take steps to prevent the destruction of crops by extreme weather. Andrea regularly sends money to her parents and her younger brother, who is studying at Ak’ Tenamit. 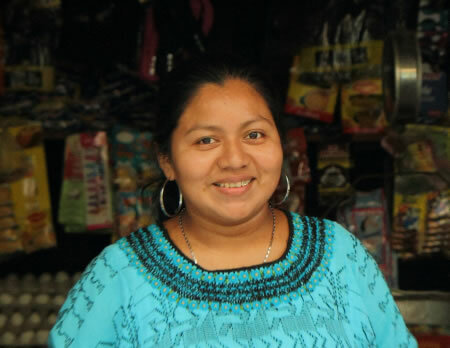 In 2010, she used her savings to open a small general store on the Rio Dulce that her family runs.